We are now at full capacity and are maintaining a waiting list. See below for details on this policy. Weekend in Quest 2017 is returning for its eleventh year to the Holiday Inn Express, opened in 2004. 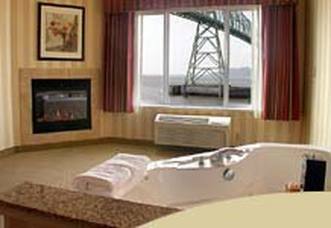 The hotel provides dramatic riverfront lodging, offering a magnificent view of the mighty Columbia. Study sessions, meals, and Shabbat services will take place at the hotel; there will also be time for walks, relaxation, exploration of revitalized Astoria and time to use the indoor swimming pool & whirlpool. For more hotel information, visit astoriahie.com. We are now at full capacity and your payment will place you on the first-paid, first-served waiting list. If you pay electronically (preferred method), the transaction time stamp determines your place in line. If you pay by check, the check's arrival time determines your place. We will email you immediately if and when a cancellation arises. If you choose to cancel, or if no place opens up for you, we will refund your payment no later than the day after the event. To check on your status, you can email Michael Feldman at mike@judaicstudies.org or mfeldman@gwu.edu. We are pleased to announce that there is NO fee increase from 2016 for current Institute for Judaic Studies' members! Although there is an increase for non-members, you can join IJS now and take advantage of the lower rates. To do so, please click HERE to become a member, close that window, and come back to this page to register for Weekend in Quest. Per person, double occupancy: Includes all programming and lectures, five meals and a river-view room. Per person, single occupancy: Includes all programming and lectures, five meals and a river-view room. No hotel: Includes all programming and lectures, three meals, but no hotel room or breakfasts. Select the appropriate fee, then click the "Pay Now" button. You'll be taken to the PayPal website to fill in your details (including number of registrants) and give your credit card information, then sent back to this page. You do not need a PayPal account — your credit card will be enough. If you do have a PayPal account, using it will be the first option you see. For questions and further information, please contact: Michael Feldman (mfeldman@gwu.edu or mike@judaicstudies.org) or Mimi Epstein (503-203-2671, mimiepstein42@comcast.net).